Monitoring a cluster is absolutely vital. Prometheus and Grafana make it extremely easy to monitor just about any metric in your Kubernetes cluster. In this article I will show how to add monitoring for all the nodes in your cluster. You need a Kubernetes cluster. Your Kubernetes cluster needs to be running. We won’t do a deep test here, we will just confirm it can run pods. Helm makes it extremely easy to make sure you use up to date versions of Prometheus & Grafana & also makes it a-lot easier to deploy and delete. If you don’t entirely trust it (I didn’t at first), you can use it to generate all the yaml configs to inspect and apply those. Installing Tiller is a bit more in-depth as you need to secure it in production clusters. For the purposes of keeping it simple and playing around, we will install it with normal cluster-admin roles. We will use yaml files so we can keep all of our setup in version control to be re-used later. Then apply and test that the service account exists in the cluster. For demo purpose we will create a role binding to cluster-admin. DO NOT DO THIS IN PRODUCTION !! Finally ! We can deploy tiller ! The --wait flag makes sure that tiller is finished before we apply the next few commands to start deploying Prometheus and Grafana. Done ! Tiller is deployed and now the real fun starts ! The first thing we want to monitor is how the nodes under our cluster are performing. Helm makes this extremely easy by shipping the node-exporter together with the Prometheus chart. We will separate our monitoring resources into a separate namespace to keep them together. This also helps if we want to set resource quotas to all monitoring services later. First, create a folder for our monitoring solution. We need a namespace to keep all of our resources in. We also want to keep this in version control in case we need to recreate our resources easily. Create a file called namespace.yml in monitoring and add the following contents. This will create a namespace in the cluster once applied. Apply & Test the namespace exists. Here is where the power of Helm steps in and makes life much easier. First we need to update our local helm chart repo. This will deploy Prometheus into your cluster in the monitoring namespace and mark the release with the name prometheus . Prometheus is now scraping the cluster together with the node-exporter and collecting metrics from the nodes, and even more information from Kubernetes. We will see these soon in Grafana. When deploying grafana, we need to configure it to read metrics from the right data sources. There are two ways of achieving this. Deploy Grafana & add the data source afterwards through the UI. Add the data source as yaml configs & deploy Grafana. Grafana will use these to automatically configure the data sources when it is provisioned. We are going to take this path as we want everything to be replicate-able without too much manual intervention. Defining the grafana data sources. Kubernetes has nothing to do with importing the data. Kubernetes merely orchestrates the injection of these yaml files. We will create these files before we deploy Grafana to ensure they are automatically added. When the Grafana Helm chart gets deployed, it will search for any config maps that contain a grafana_datasource label. So we will add one in our config. In the monitoring folder, create a sub-folder called grafana . Here is where we will store our configs for the grafana deployment. We need to create a config map for the prometheus data source. Lets go over that briefly. We are creating a config map which defines an attribute with yaml which we will inject into grafana in a moment. Here is where we add the grafana_datasource which will tell the grafana provisioner that this is a datasource it should inject. Here is where we add the attribute called datasource.yaml. This is the name of the file the grafana provisioner will inject. The |- tells Kubernetes to interpret the following lines as text. The following yaml definition is the actual definition grafana will read. 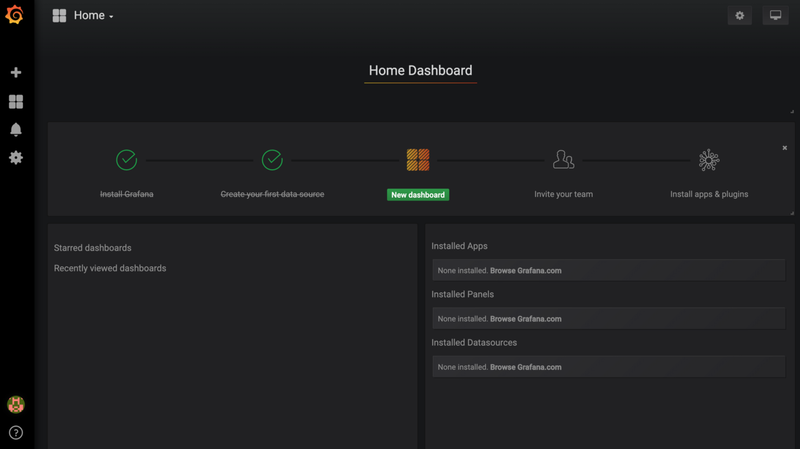 name: Prometheus is the name of the datasource which will be saved in Grafana and used later when defining dashboards. type: prometheus tells Grafana to interpret the data in the Prometheus format. There are a few formats which Grafana can read. access: proxy tells Grafana it is reading the data from a Prometheus server and not from an api. orgId: 1 is used in Grafana when creating users. 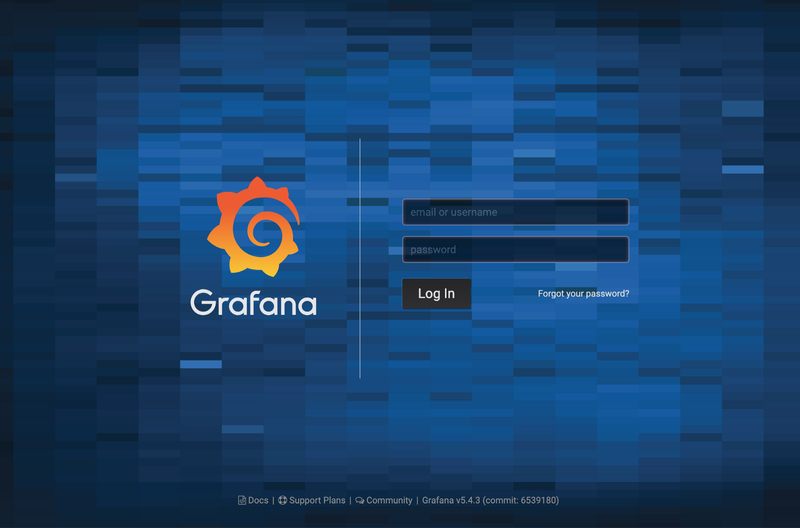 url: … is the url at which Grafana should reach the Prometheus server. prometheus-server.monitoring.svc.cluster.local is a host which points at a Kubernetes service. Kubernetes DNS will ensure you always reach the Prometheus service even if the pod moves and changes IP. When Grafana gets deployed and the provisioner runs, the data source provisioner is deactivated. We need to activate it so it searches for our config maps. When using a predefined Helm chart, we can override it’s startup values by specifying the overrides in a values.yml file, and passing that in when we do helm install . This will override only the values we have specified and will leave the rest of the defaults intact. To see all the possible values when running Grafana checkout: https://github.com/helm/charts/tree/master/stable/grafana. Also read through the values.yml file as it explains in very clear detail when and how to use the values. We need to create our own values.yml file to override the datasources search value, so when Grafana is deployed it will search our datasource.yml definition and inject it. This will inject a sidecar which will load all the data sources into Grafana when it gets provisioned. Now we can deploy Grafana with the overridden values.yml file and our datasource will be imported. Grafana is deployed with a password. This is good news. But whats the password ? djO3qRObroIY6JYyzvTJrHUeTuy4z26D2tbwTizP is the password to your Grafana dashboard. Login with the username and password you have from the previous command. 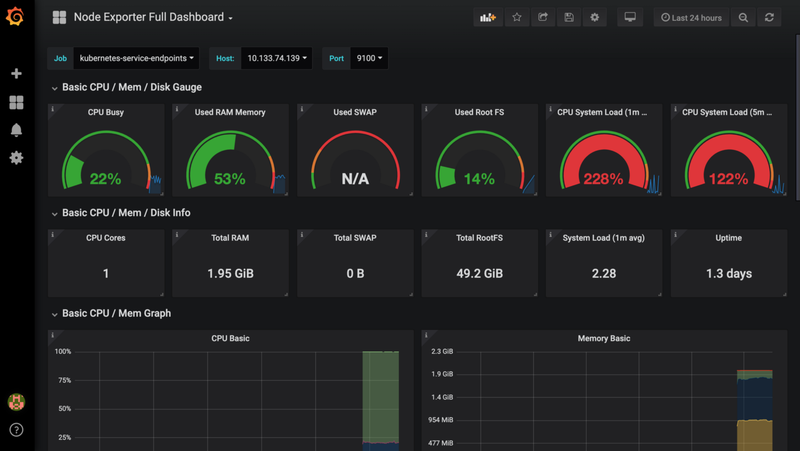 Grafana dashboard after login. No metrics yet ? 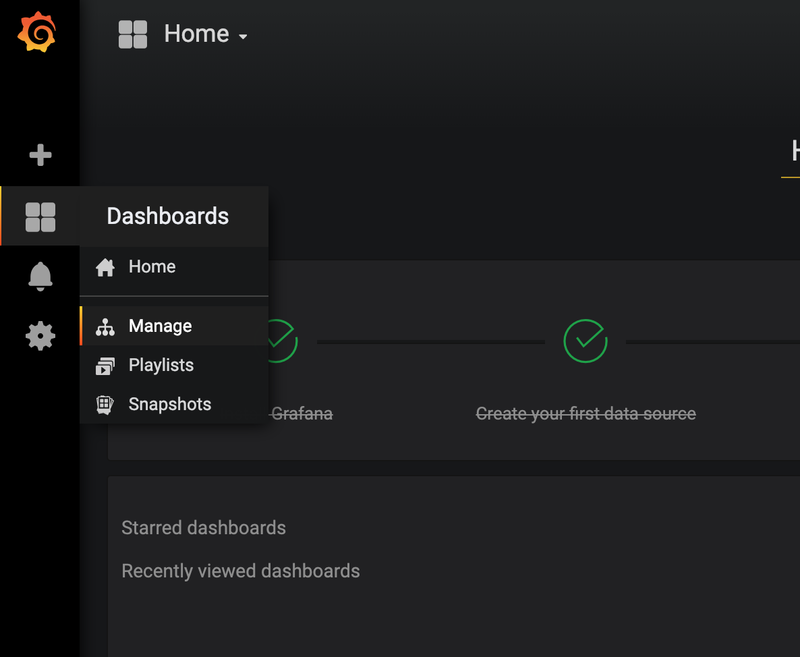 Here you will find many many dashboards to use. We will use this one as it is quite comprehensive in everything it tracks. On the next screen select a name for your dashboard and select Prometheus as the datasource for it and click Import. The list of metrics is extensive. Go over them and see what is useful, copy their structures and panels and create your own dashboards for the big screens in the office !